The new Quest NewQuay in Melbourne is the largest in the group’s Australian network. 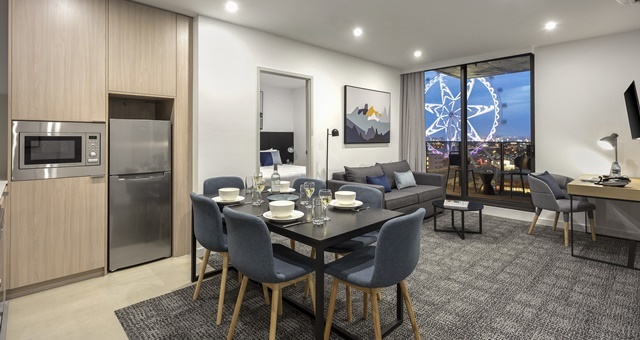 Doors have opened to guests for the first time today at Quest NewQuay in Melbourne Docklands, which with 221 apartments makes it the company’s largest Australian apartment hotel – snatching the title from Quest North Ryde at 170 apartments. Located on the city fringe near Victoria Harbour, the new Quest location is around twice the size of many of its regional counterparts and is close to Marvel Stadium and the free city circle tram. It is around 20 minutes’ drive to Tullamarine Airport. Construction was undertaken by MAB Corporation and is the 14th building completed by MAB on behalf of Quest. Targeted at professionals seeking a self-contained home experience, Quest NewQuay offers a combination of studio, one, two and three-bedroom apartments. True to the brand’s hallmark, each apartment features a kitchenette or full-size kitchen, individual laundry facilities and private balcony. Guests can make use of a business centre and conference facilities, fitness centre, rooftop BBQ and recreation area. Quest Apartment Hotels’ Chief Commercial Officer, Craig Ryan, labelled the NewQuay establishment as the company’s most ambitious property to date. Quest NewQuay is the company’s 13th property in the Melbourne metropolitan area. For a photo gallery inside the new Quest, CLICK HERE.